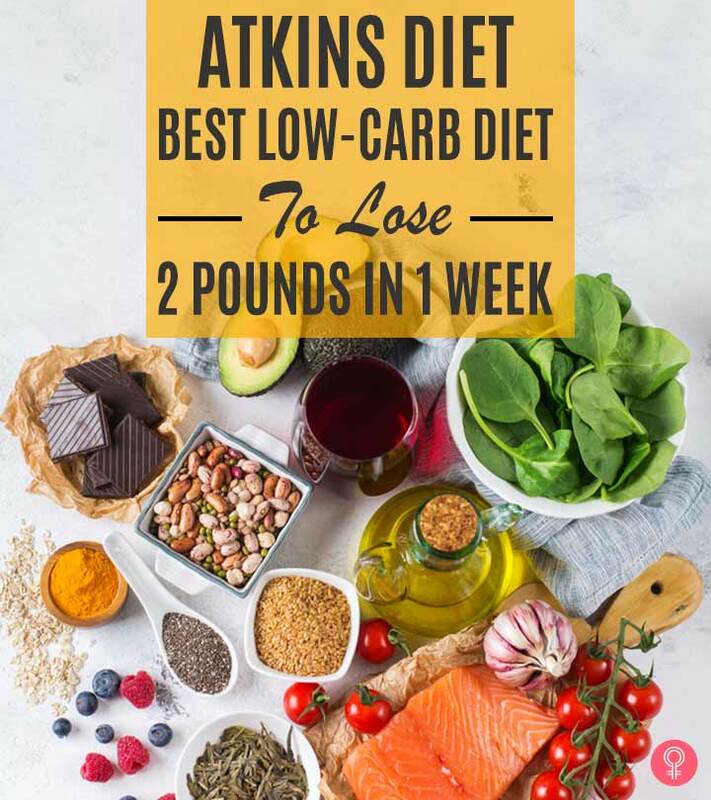 The Atkins diet is a popular low-carb diet for weight loss. It helps you lose 1-2 pounds per week or 10 pounds in a month. Scientists have found that the Atkins diet prompted about 0.1-2.9% more weight loss in a year in dieters than behavioral counseling (1). The best part is, you do not have to count calories and go hungry, and yet, you will lose the weight! Isn’t that the best way to shed fat and get back in shape? 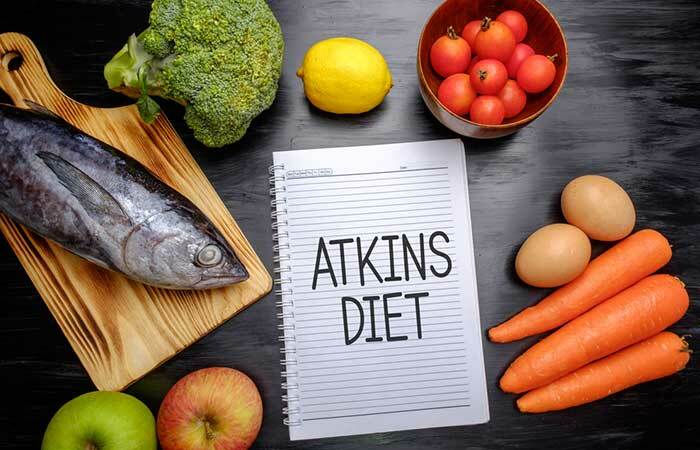 Read on to know everything about the Atkins diet – what it is, how it works, Atkins diet meal plan for weight loss, breakfast, lunch, dinner, and snack ideas, and much more. Swipe up! The Atkins diet or Atkins 20 is a low-carb diet created by Dr. Robert C. Atkins for his patients. He eliminated all sources of simple carbs/sugars and allowed his patients to consume a lot of protein, healthy fats, and complex carbs (veggies and fruits). 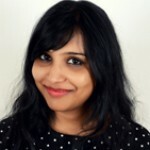 This helped the patients feel full and not hungry and famished like other restrictive diets that give more importance to counting calories than nutrition. This approach showed results immediately and became a trusted doctor-advised weight loss diet. 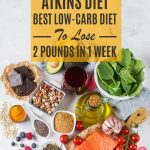 But the question is, there are so many low-carb diets, what’s so special about the Atkins diet? To get the answer, you have to know how it works for your body. Find the answer in the next section. Allowing the consumption of nutritious foods. Lowering blood sugar and making your body more insulin sensitive. Increasing muscle mass, boosting the metabolism of the body. Lowering triglycerides in the blood. Atkins diet 4 phases. WAIT! What? Well, this is where Atkins diet is different and effective as compared to other low-calorie diets. It is divided into four phases – Phase 1, Phase 2, Phase 3, and Phase 4. Phase 1 (Induction) High-protein and high-fat diet with 20 grams of carbs (leafy greens) per day for 2 weeks. Phase 2 (Balancing) High-protein and high-fat with a moderate amount of nuts, fruits, and low-carb veggies. Phase 3 (Fine Tuning) High-protein and high-fat with limited amounts of complex (good) carbs. Phase 4 (Maintenance) High-protein and high-fat with as much complex carbs as you want. If this looks intimidating, fret not. I have created a 1-month Atkins diet plan to help you shed 10 pounds quickly. Now, you may be concerned that the Atkins menu plan is not vegan-friendly. Well, if you know a few substitutes, you can follow a vegan Atkins diet. Take a look at the following substitute list. So, you see, it’s not that difficult to make the diet your own. Now, let me make your life simpler. Just screenshot the following Atkins diet food list and use it the next time you are at the supermarket. Proteins Eggs, fish, ground turkey, bacon, mushroom, tofu, lentils, cottage cheese, milk, soy milk, and buttermilk. Healthy Fats Avocado and olive oil. Veggies Veggies Broccoli, cauliflower, zucchini, kale, collard greens, chard, spinach, arugula, and radish greens. Beverages Milk, soy milk, bulletproof coffee, green tea, black tea, white tea, and herbal teas. Herbs And Spices Cinnamon, fenugreek seeds, thyme, rosemary, oregano, cardamom, clove, garlic, ginger, chili flakes, basil, dill, sage, bay leaves, star anise, saffron, and fennel seeds. Proteins Eggs, fish, ground turkey, bacon, mushroom, tofu, lentils, beans, cottage cheese, milk, soy milk, and buttermilk. Healthy Fats Avocado, ghee, olive oil, and rice bran oil.. Veggies And Fruits Kale, spinach, carrot, broccoli, cauliflower, arugula, chard, cabbage, beetroot, zucchini, tomato, cucumber, grapefruit, apple, muskmelon, berries, and banana. Nuts And Seeds Almond, walnut, pistachios, hazelnuts, Brazil nuts, and flax seeds. Beverages Green tea, black tea, white tea, herbal teas, and coconut water. Healthy Fats Avocado, ghee, olive oil, rice bran oil, sunflower butter. Veggies And Fruits Kale, spinach, carrot, broccoli, cauliflower, arugula, chard, cabbage, beetroot, zucchini, tomato, cucumber, grapefruit, apple, muskmelon, watermelon, berries, and banana. Nuts And Seeds Almond, walnut, pistachios, hazelnuts, Brazil nuts, flax seeds, sunflower seeds, sunflower butter, pepita, pumpkin seeds, and melon seeds. Beverages Milk, soy milk, buttermilk, green tea, black tea, white tea, herbal teas, and coconut water. Proteins Eggs, fish, ground turkey, bacon, mushroom, tofu, lentils, sprouts, beans, cottage cheese, milk, soy milk, and buttermilk. Veggies And Fruits Kale, spinach, carrot, broccoli, cauliflower, arugula, chard, cabbage, beetroot, zucchini, bell peppers, scallions, pumpkin, bottle gourd, bitter gourd, okra, eggplant, Brussels sprouts, tomato, cucumber, grapefruit, apple, muskmelon, watermelon, berries, and banana. Nuts And Seeds Almond, walnut, pistachios, hazelnuts, pecan nuts, pine nuts, macadamia, Brazil nuts, flax seeds, sunflower seeds, sunflower butter, pepita, pumpkin seeds, and melon seeds. Beverages Green tea, black tea, white tea, herbal teas, milk, soy milk, buttermilk, bulletproof coffee, and coconut water. This chart will make your grocery shopping easy for each phase. 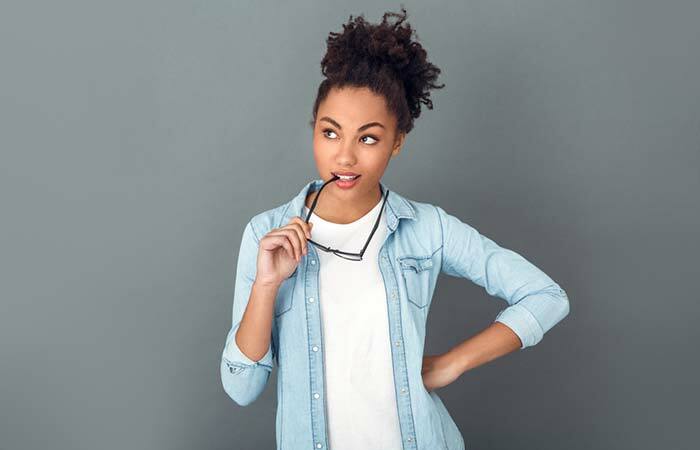 But which foods should you avoid? Find out next. Veggies – Avoid high GI (glycemic index) veggies like pumpkin, red bell pepper, potato, beetroot, and sweet potato during Phases I and II. Fruits – Avoid high GI (glycemic index) fruits like grapes, pineapple, mango, jackfruit, watermelon, peach, and banana during Phases I and II. Proteins – Avoid consuming chickpeas, sprouts, and kidney beans during Phases I and II. Fats And Oils – Avoid consuming nut butter, butter, margarine, and canola oil during Phases I and II. Nuts And Seeds – Avoid cashew nuts, pumpkin seeds, melon seeds, and sunflower seeds during Phase I. Now that your grocery shopping list for Atkins diet is sorted, you can get cooking. Not sure what to cook? 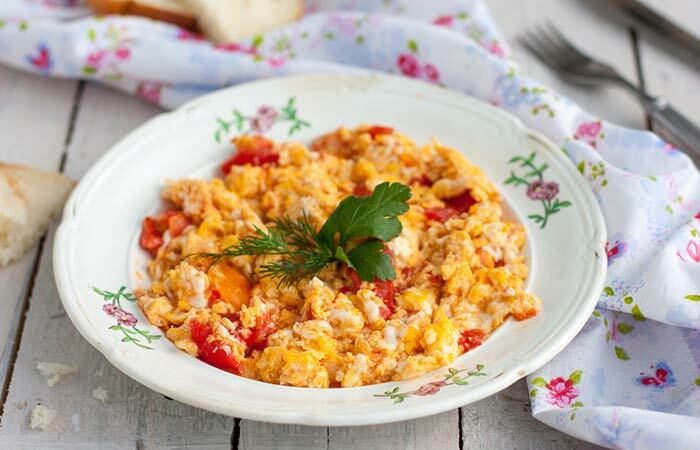 Here are a few Atkins diet breakfast, lunch, and dinner recipes that you are going to savor. Take a look. Add salt and pepper. Whisk well. Heat a teaspoon of olive oil in a pan. Pour half of the whisked egg into the pan. After 30 seconds, add the mushroom slices. Cook on low flame for a minute. Flip the egg and cook for 2 minutes. 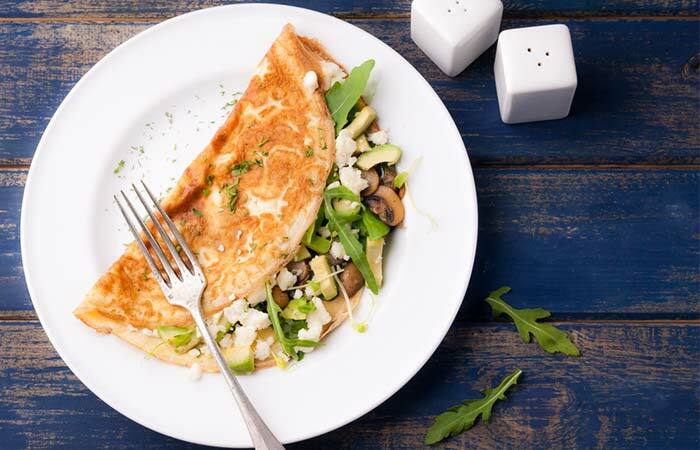 Transfer the omelet to a plate. Add arugula, avocado, and feta. Fold the omelet and enjoy! Grate the tofu using a grater or pulse it in a food processor. Add the chopped garlic and cook until it becomes brown. Add the chopped onion and cook it for 2 minutes over low flame. Add the grated tofu, tomatoes, turmeric, salt, and black pepper. Stir and cook for 3-4 minutes. Let the water from the tofu dry. Divide the cooked tofu equally on four different plates. Sprinkle dried basil on top. Garnish with fresh dill and basil. Mix lime juice, a tablespoon of olive oil, thyme, salt, and a bit of pepper in a bowl. Rub this mixture on the salmon. Preheat the oven and lightly grease the baking tray. Place the fish on the baking tray and bake it at 200o Celsius for about 12-15 minutes. No need to flip the fish. 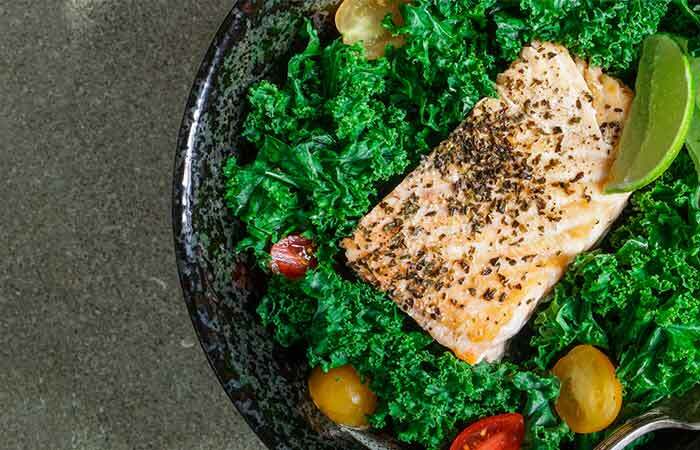 Wash the kale and place it on a plate. Place the baked salmon on top. Drizzle some olive oil and balsamic vinegar on it. Season the kale, and your lunch is set. Toss in the chopped garlic and fry until it turns brown. Add the broccoli florets. Stir and fry for 3 minutes. Add the sliced mushrooms and salt and cook for 2 minutes. 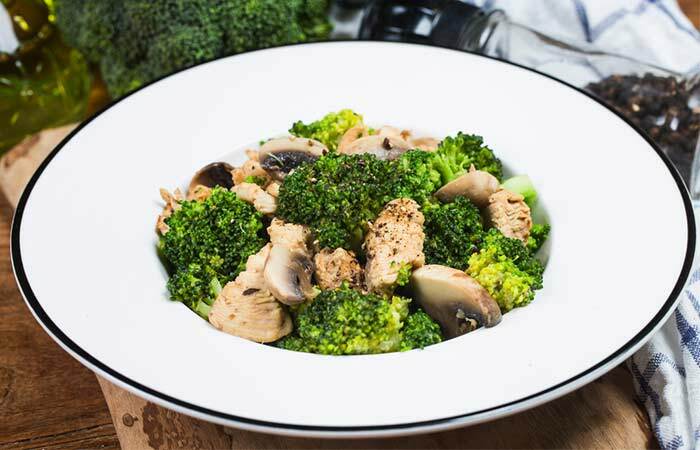 Transfer the stir-fried mushroom and broccoli to a plate. Drizzle some lime juice and sprinkle chili flakes. Your lunch is ready! Mix olive oil, lime juice, paprika, dried rosemary, salt, and pepper in a small bowl. Rub the mix on the chicken breast. Heat the grill pan and add the chicken breast. Cook it for 5 minutes on each side. Toss the greens in a bowl. Drizzle some olive oil, salt, and pepper. 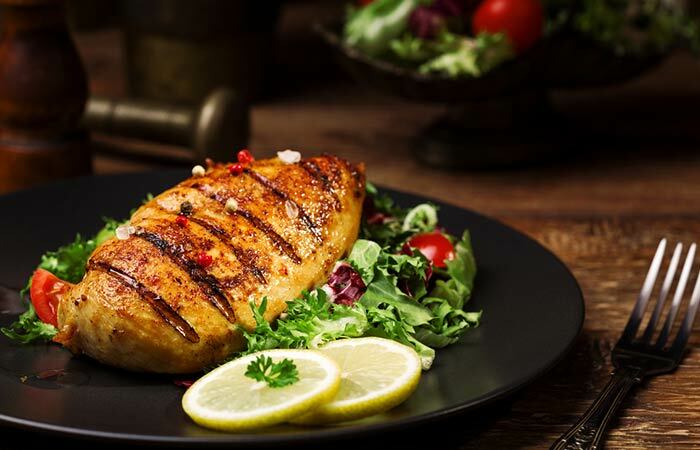 Place the pan-grilled chicken breast on the greens and enjoy your dinner. Toss the cauliflower florets, spinach, garlic powder, onion, ginger powder, gram flour and a tablespoon of olive oil in a food processor. Blitz until every ingredient gets combined. Make several tikkis and coat each tikki with a thin layer of whole wheat flour. Heat two tablespoons of oil in a pan. Fry the tikkis for 5 minutes on each side. In the meanwhile, toss the chickpeas into a blender. Add lime juice and a little bit of water. Blend into a thick and smooth paste. Scoop the paste out into a bowl, drizzle some olive oil, and sprinkle paprika. Your hummus is ready. 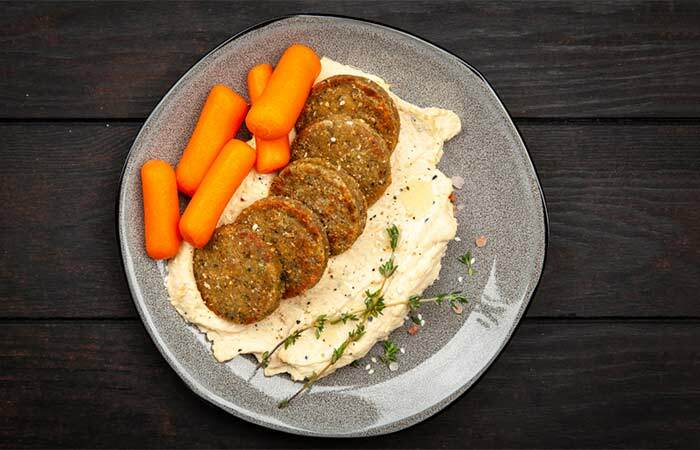 Enjoy the hot and crispy tikkis with hummus for dinner. So, breakfast, lunch, and dinner are set. But what about those snack times that often make us go overboard with junk food? Scroll down to find some yummy low-carb snacks. So, the snack part is also taken care of. But sometimes, only lowering your carb intake is not enough, especially if there’s a special occasion coming up. And for that, sorry to break it to you, you have to do a few exercises that will help burn the fat fast. Here’s a simple workout plan that you must do for at least 10-20 minutes every day. Stretch your arms, calves, neck, thighs, and waist. There you go! I am sure if you do this every day for two weeks, you will see the benefits of this diet. And it’s not just weight loss. Here’s a list of the other benefits of the Atkins diet. Helps maintain the weight loss. So, you see, there’s a ton of other areas where this diet can help you. That said, like any other diet, the Atkins diet has a few drawbacks. Check them out below. feel irritable and moody as you will crave for sugar for the first two weeks. Yes, the Atkins diet is safe. And it helps you drop pounds in just a few weeks’ time. Since the creation of the Atkins diet in 1972, it has gone through many tweaks that have made the diet more heart health-friendly. The main concern that bothers scientists is the high amount of animal fat from meat the dieters are recommended to consume. But if you see the diet plan given here, we have recommended beef and other sources of red meat in limited amounts. So, if you can fine tune the diet and consume white meat or lean protein sources from animals, the Atkins diet is completely safe. Also, vegans and vegetarians can choose plant-based proteins as substitutes for animal proteins. Just keep the following points in mind. Follow the phases to get the best results. Do not consume high GI fruits, veggies, nuts, and seeds in the first two phases. Buy your groceries on weekends. Order food or have high-carb foods from restaurants. 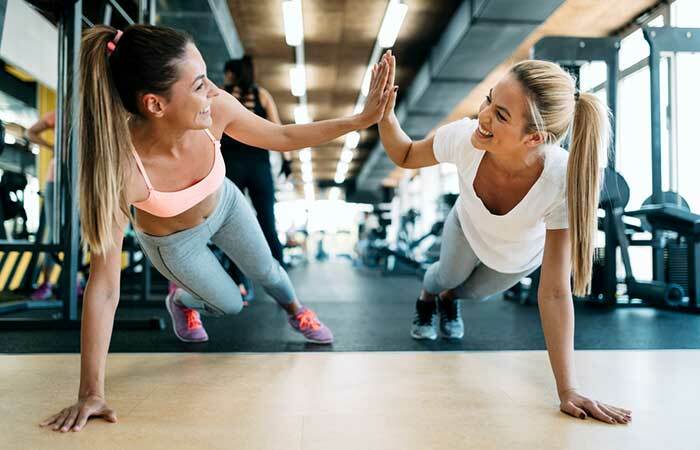 Workout regularly – take a day or two of rest. Don’t overtrain – you will injure yourself. Stay hydrated. Do not skip any meal. you want to lose weight quickly and also maintain the weight loss. It is a good idea to start following this diet when there’s a special occasion coming up in 2-4 months. you are a meat eater. You will have the added advantage of not having to search for animal product substitutes. That said, even if you are a vegan or vegetarian, you can easily find animal protein substitutes in supermarkets and online. you want to lose that last bit of stubborn fat in your belly, waist, back, and thighs. the uric acid levels in your body are high as it may lead to further complications. you are suffering from kidney problems. you are obese, your blood triglyceride levels are high, and you need a doctor to recommend the best diet for you. The Atkins diet or Atkins 20 is a great and balanced low-carb diet that has worked for many. And if you decide to go on this diet, you will see great results. Just be careful with your current medical condition and consult your doctor if you should follow this diet. And if you get a thumbs up, follow the diet plan, workout regularly, and get fit and fabulous. Take care!